To empower children to be self-directed learners and responsible decision makers. Board of Education Meeting - 7:30 p.m.
Lyon School 2nd Grade Program - 10:00 a.m. & 1:30 p.m.
ELECTION DAY - PR Gym is a polling place. School is in Session. For their safety, students are not allowed in the building without supervision. Supervision at PR begins at 7:40am. Students will be expected to wait patiently in the vestibule until that time. The Memory Project is an opportunity for first grade students to connect with a senior citizen through story. We are looking for seniors who are able to come to Lyon for a 30 min visit April 1-5. We ask that they share a story of a childhood memory. We will videotape their story telling session and recreate the story shared through visual art and drama. The senior is invited to return the week of May 24-June 3 to enjoy the dramatic re-make as well as the visual illustrations of their story. Fine Arts classes have used this experience to facilitate learning that the arts can tell a story and communicate a message. The opportunity of building an intergenerational relationship has been a wonderful experience for the first graders and we are looking forward to meeting this year’s storytellers. Any senior who would like to spend some time sharing his/her stories with Lyon students is welcome to join us. Use the link below to indicate your availability. If you need more information you can check out this short video which explains the project more. We are pleased to announce all First and Second grade students will be participating in a Bicycle Training and Safety unit during their Physical Education classes. This unit will start on April 5th and continue through April 19th. Weather permiting, we are hoping to get outdoors as much as possible. For safety purposes, all students will be required to wear a helmet and gym shoes. Students should bring their own properly pre-fitted helmet from home. For fitting tips you may choose to visit: www.helmets.org/fit.htm. We will have a very limited amount of helmets available to borrow at school. The students will be divided into ability groups of non-riders and riders. Bicycles will be sized to each student. Instructional areas will have daily targets including: Bicycle Safety, proper helmet fitting, safe-handling skills, coordination, balance and motor planning. Students will ride on the blacktop located on school property . We are in need of 1st & 2nd Grade Parent Volunteers to help with small groups of students. Second Grade students will be riding in the morning and First Grade students in the afternoon. Please sign up on the Volunteer Link that will be coming soon to the Lyon/Pleasant Ridge PTA Website. Seleccione el tipo de pago que desea realizar. Por favor, póngase en contacto conmigo si tiene alguna pregunta. 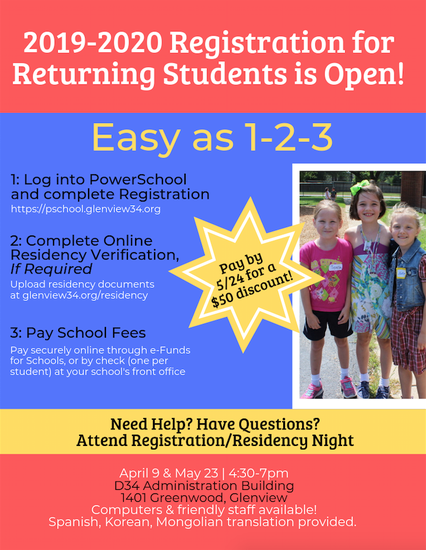 Registration is now open for the 2019 - 2020 school year. 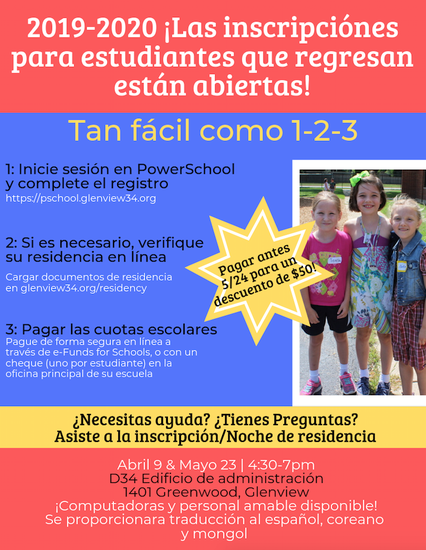 Please visit https://www.glenview34.org/parents/registration, and follow the steps in order to register your child at District 34. Please contact Lyon School if you have any questions at (847) 998-5045. Coming Soon - Eagle Running Club! WHAT? – A six week running program open to all PR students. This training is in preparation for the Lew Blond Memorial 5K (3.1mi) Run on Saturday, May 18th 2019. Students must sign up for the 5K race on their own. The site to register is: http://lewblondrun.org/. WHEN? - Training sessions will take place Mondays and Wednesdays after school until 3:30p.m. The running club will begin on Monday, April 8th and continue until Wednesday, May 15th. WHERE? – All practices will take place in the school building or on the field next to the gym. The race will take place at Maple School in Northbrook. WHY? 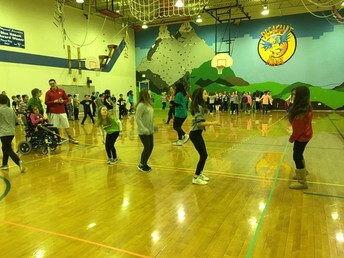 – This is a great way for students to work on their cardiovascular fitness, set personal goals, and most importantly, have fun during this healthy learning opportunity. The sense of accomplishment after finishing a race can be incredible as well! COMMITMENT? – We are following a beginner’s 5K schedule, which starts light at first, then progressively gets more difficult each week. Therefore, it is important to attend as many sessions as possible so that students can build up their endurance. PERMISSION? – Every child needs a signed permission slip to stay for the training sessions. Permission slips will be available in the front office and in the gym. 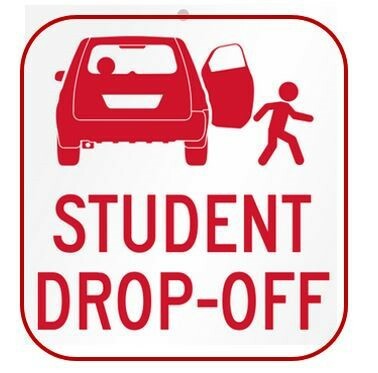 All students must be picked up or have made arrangements to walk home by 3:30p.m. COST? – The race registration fee is $22 for children 14 and under and $32 for adults before April 26th. If a child is unable to participate in the race due to the cost, please let us know and we will take care of the fee. Eagle Running Club shirts will be available to purchase in the beginning of May. Your child does not need a shirt to participate in the race. 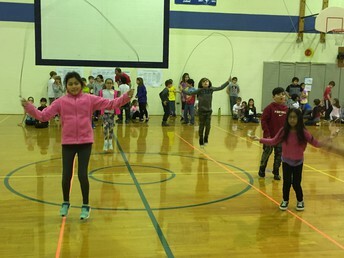 On March 8th, Pleasant Ridge students participated in the Kids Heart Challenge (formerly Jump Rope for Heart) event. 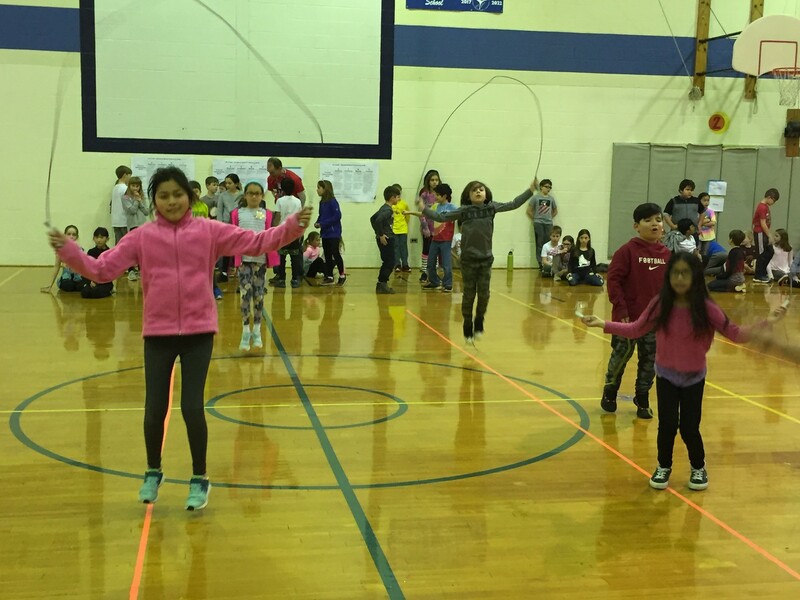 Throughout the hour, each grade level partook in long and short rope challenges, dancing, and watched the Tim Baetz Happy Heart Top 10! 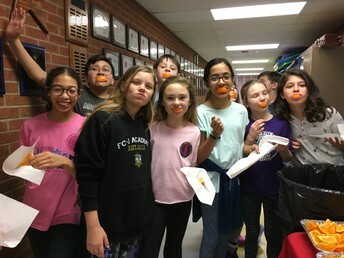 Everyone also enjoyed orange slices donated by Sunset Foods in Northbrook. The excitement and energy was incredible! 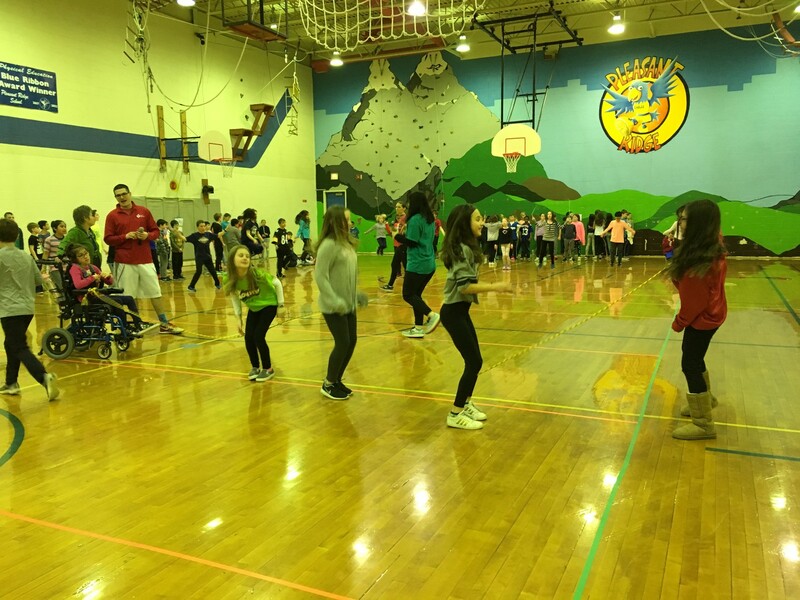 Thank you to all who donated to the American Heart Association and a special thank you to all the parents who volunteered! If your child needs to take any medication during the school day -- either prescription or over-the-counter (including ibuprofen or other pain reliever) -- you must submit this form with a doctor's signature to the health office at school (Aquí está la forma en español.). There are no exceptions to this policy. Students should not have medication in their backpack or pocket; parents must provide the medication indicated on the form, in original packaging, to the school nurse. All health forms are posted on the District 34 website on our frequently used forms page. If you have questions, please contact the Lyon health office at (847) 657-2894 or the Pleasant Ridge health office at (847) 657-2794. All students that carry a cell phone to school must have a cell phone usage form on file with the front office. Please fill out the attached form and send it to the Pleasant Ridge or Lyon Office. The guidelines are included in this attachment. We have entered the time of year when we see influenza (flu) and other respiratory viruses at school. We want to let you know what steps we are taking to keep our school community healthy and how you can help. Click here for more information. Please review this important food service information which includes the menu cycle and the cycle calendar. Click here for the December Food Service Newsletter. Is your child missing his/her gloves, backpack, lunchbox, water bottle, hat, scarf, coat, boots etc.? Lyon school’s lost and found is overflowing. If your child is missing an article of clothing, please stop by Lyon to look through all the lost items. All kindergarten, second and sixth grade students must have a dental report on file in the health office by May 15, 2019. If your child has been to the dentist within the past year, please ask the dentist to fill out the state required dental form and return it to the Lyon health office. If your child has not been seen by a dentist within the past year, please make an appointment as soon as possible and return the state dental form to the health office. If you have any questions or need a copy of the state form please call Jan Gode, Lyon Health Coordinator at (847) 657-2894 or fax your completed form to (847) 998-9701 attn: Jan Gode. The State of Illinois requires all children to present evidence of having had a physical examination, including all required immunizations. A physical examination (no more than one year old) including immunizations (signed by the parent/guardian and a health care provider) is required for students entering kindergarten and again in 6th grade. If a student is transferring into District 34 for the first time, he or she is also required to provide a copy of a State of Illinois physical exam including immunizations (signed by parent/guardian and a health care provider). If your child will be absent from school, please call the Health Office phone number at (847)657-2894. You can call this number after hours and leave a message at any time. Leave your child’s name, the teacher’s name, reason for the absence and expected number of days they may be out of school. I appreciate everyone's patience during this busy daily time. Thank you for your cooperation, our goal is to safely dismiss children from school and have you start your afternoons as soon as possible!